You added a new package to the distribution. 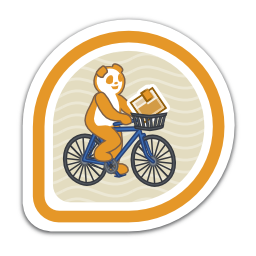 First earned by besser82 on 2013-08-15. Last awarded to jflory7 on 2017-11-11.
krege ankursinha zeenix achernya ahs3 vpodzime peter jam3s dfateyev parasense jdieter jvanek santiago sagitter alon daveisfera fmuellner kg4sgp smani mattrose corsepiu jplesnik tdawson goldmann mso dvratil cheeselee lsm5 mizdebsk mtasaka immanetize orion rhughes spstarr dbruno kiilerix ktdreyer delete jamielinux brouhaha jpopelka bkabrda adamwill cypret dtardon gholms f1ash vgoyal ignatenkobrain anujmore axilleas msrb codeblock jhernand bsjones dcbw apevec luya bronhaim besser82 sea roma gil msimacek bcl rolffokkens dcallagh vicodan thozza tomh slaanesh raveit65 than rdieter fabiand patches vondruch mbriza pghmcfc limb ianweller cicku rrati matt rmattes ellert bochecha valtri kevin mrunge rjones dridi psabata ralph leigh123linux zbyszek musuruan mariobl fab halfie mcepl msuchy stevetraylen jorti mathstuf petersen sergiopr kalev jkaluza pnemade imcleod simonm ueno lorenzodalrio lkundrak pwouters dmalcolm siwinski jmoskovc mcpierce leamas pmackinn ppisar grover puiterwijk jstanek pjp pbrobinson pcpa rmarko mkrizek echevemaster mattdm jariq tstclair willb dbmacartney paller rohara xqueralt thm simo georgiou jcp vpopovic churchyard terminalmage spot remi ... and 267 other people.